As the weather gets colder, there are plenty of ways to warm up this holiday season: sitting by the fire, drinking some hot cocoa and cuddling up to loved ones. Now, thanks to Canadian retailer Kigurumi.ca, you can stay cozy and cute — with these animal onesies. Kigurumi, or "costumed character," are animal-themed onesies that originated in Japan. Kigurumi.ca is the official Canadian distributor of SAZAC kigurumi, "Japan's number one kigurumi manufacturer." With nation-wide shipping plus retail stores in Toronto and Montreal, you'll be able to send the perfect onesie anywhere in Canada. Here are three kigurumi that will make your loved ones feel extra cozy this holiday season. Sharks can survive in frigid temperatures during the winter, and now you can too with the Shark Kigurumi Onesie. Complete with dorsal and tail fins, you'll be warm enough for anything — even some mid-winter barbecuing. Who says unicorns don't exist? The Blue Unicorn Kigurumi Onesie features a big white belly plus a furry mane and tail. With details like that, you'll be able to turn even the staunchest of sceptics into believers. Rainbows, neon and cats are pretty great on their own, but why not combine them all for a cozy wearable experience? 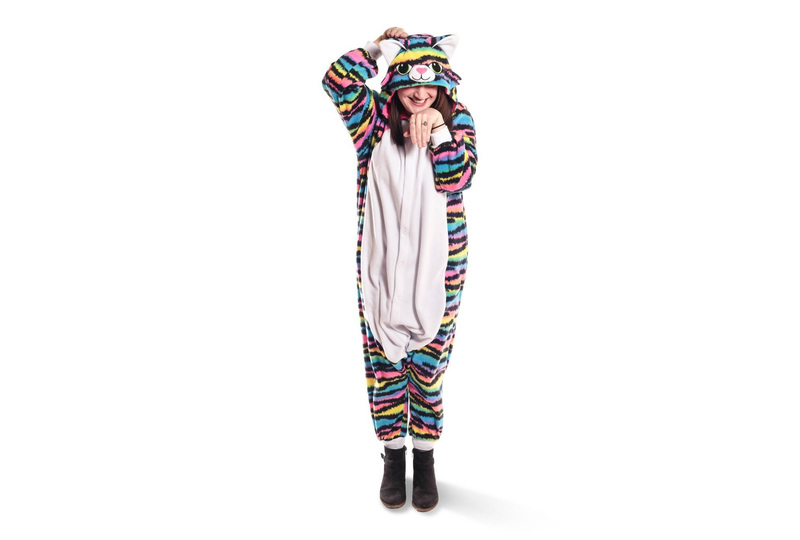 This Neon Rainbow Kitty Kigurumi Onesie is both dazzling and delightful.